I recently received my Fourth US National Bonsai Exhibition Commemorative Album and have thoroughly enjoyed studying the over 200 top quality bonsai displays in what is widely agreed upon to be the best US National Exhibition to date. As you probably know, this exhibition and commemorative album is the product of the tireless efforts of William N. Valavanis. As I have come to expect, the album is expertly photographed by Joe Noga and professionally designed and annotated by Bill and his staff. 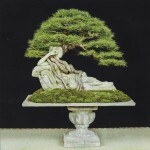 However, what truly makes this year’s album special to me is the strong representation of Canadian bonsai art. 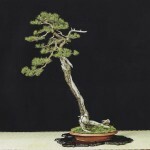 For decades, bonsai enthusiasts from Ontario and Quebec have traveled to Bill’s International Bonsai Arboretum and other venues in Rochester to receive a world-class bonsai education. 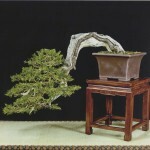 For many of us, this education culminated in an invitation to share some of our best bonsai in the 2014 USNBE. 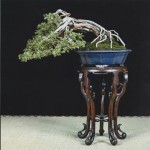 Members of the Karamatsu Bonsai Study Group in Montreal have exhibited their stunning bonsai at past US National Exhibitions, but 2014 marked the first time that special exhibits from both Quebec and Ontario bonsai societies were invited, making for a stronger Canadian presence than ever. I counted fourteen displays from private collections in Ontario and Quebec and almost all of them were collected native specimens. Those who know me know that I firmly believe that our native species, especially Thuja occidentalis and Larix laricina, have the potential to be absolutely world class bonsai, even next to the mind-exploding yamadori of the west coast. It makes me extremely proud to see them well represented in this album and I hope that the Canadian presence at this important exhibition will continue to grow. Bill was kind enough to allow me to reproduce some of the images from the album here and I have decided to focus on the Canadian trees. To fully appreciate the beauty of this exhibition and see more of the outstanding Canadian trees (not to mention the award-winning American masterpieces), you can easily purchase your own copy from Bill. 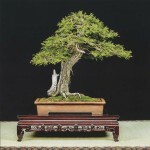 Incredible Thuja occidentalis by David J. of the Toronto Bonsai Society. David custom made a support system to safely transport this tree to Rochester. Larix laricina, originally by Nick Lenz and affectionately named “Penelope”. This was the first time this famous tree has been exhibited at such a large venue and she certainly attracted a lot of attention. 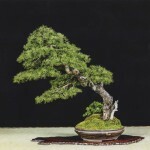 Larix laricina by David Easterbrook, frontman of the Karamatsu Bonsai Study Group. This tree was absolutely enormous – definitely one of the largest in the show. ‘Crimson Frost’ Red Birch by Mike, president of the Bonsai Society at Royal Botanical Gardens. 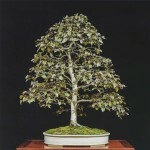 This tree also didn’t make it home from the exhibition, as it is now a permanent resident of Doug Paul’s prestigious Kennett Collection, often cited as the best bonsai collection outside of Japan. 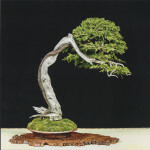 Thuja occidentalis by Brian Donnelley, Karamatsu Bonsai Study Group. Brian is a master of managing Thuja foliage and I was fortunate to have a chance to pick his brain when I bumped into him during the show. Larix laricina by Brian Donnelley. An elegant tree which really gives the viewer a “sense of place”. This entry was posted on May 30, 2015. 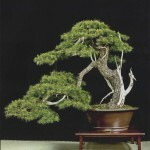 It was filed under Exhibition and was tagged with Bonsai, Exhibition, Larix, Pinus banksiana, Rochester, Thuja, Toronto, yamadori. Little thuja looking very sharp indeed! Thanks for showing, hope you’re well.